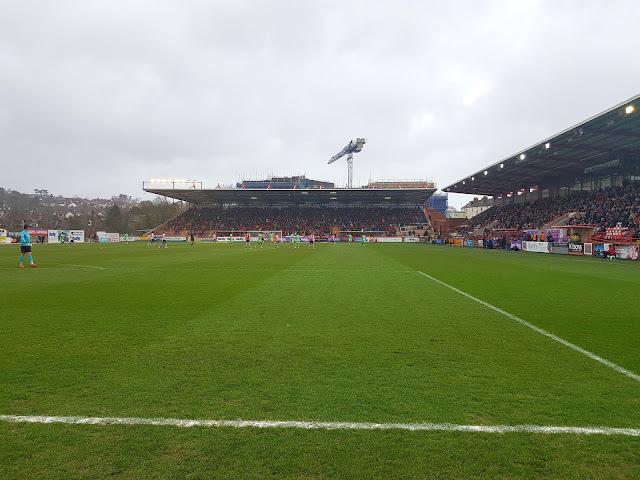 My twelfth ground of 2019 was on Saturday 16th March at St James Park in Exeter, Devon. The match was Exeter City vs. Colchester United in Football League Two. St James Park is located to the north-east of Exeter city centre in a built-up residential area. To the south is a road with terraced houses beyond and the eastern side is bordered by a mixture of housing and a conference centre. Student apartment blocks are under construction behind the northern end while the eastern side runs adjacent to the Exeter to Exmouth railway line tapering the space available on this side. St James Park railway station is in this area right next door to the ground while the better served Exeter Central and Exeter St Davids railway stations are a mile east of the stadium. The venue has been home to the club since they were formed in 1904. The Main Stand runs the length of the south-eastern side of St James Park. Constructed in 2001 to replace the Cowshed Terrace, the current structure is an all-seater one with a capacity of 2,116. This figure includes a section for away supporters that can range between 200 and 1,000 depending on the level of visitors. The middle section has the two dugouts positioned at the foot of the stand with corporate facilities at the back of it. There is also a TV gantry hanging from the roof just above these corporate boxes. With this being the main stand it houses the player and officials dressing rooms, ticket office and club shop. The oldest stand in the stadium is the Big Bank which sits behind the goal at the north-eastern end. Up until 2000 this end was an uncovered terrace which extended round into a quadrant meeting with where the Main Stand now resides. At the turn of the century renovations were undertaken to improve the stand including the installation of a roof. The Big Bank has a capacity of 3,971 and is the area containing the majority of the most vocal home support. The remaining two sides of St James Park are very new. On the north-west side the Old Grandstand was showing its age after 90 years in place so was demolished, with the new Adam Stansfield Stand opening in its place in October 2018. This functional all-seater stand can hold 1,599 fans and its cantilever roof is an upgrade on the Old Grandstand which had a number of supporting beams restricting views of spectators. 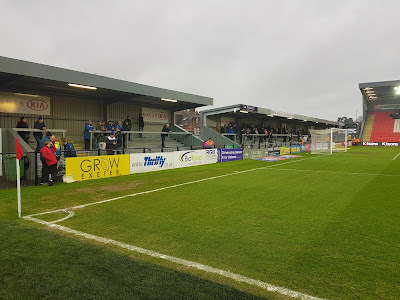 Like its predecessor the stand runs from the southern end of the pitch to just past the halfway line - this is due to the land tapering off as it progresses north because of the railway line running past the bottom of the grass bank beyond the stadium. The area behind the goal at the south-west end of the ground also dates to October 2018. This was previously an unwelcome end for away fans with an shallow seven-row uncovered concrete terrace split into two by an emergency exit access in the middle. The new set-up keeps this split in the middle but has two sections of a ten-level covered metal terrace in two sections. The St James Road Stand is given to away supporters and can hold 1,010 individuals. This game was an important one between two promotion hopefuls with Exeter knowing a win would elevate them to the play-off places, pushing Colchester out in the process. 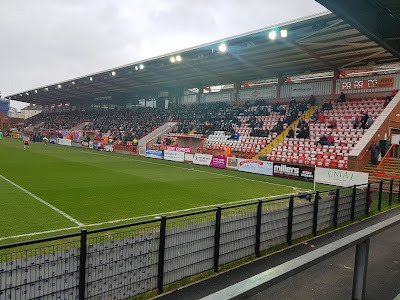 The first half was a cagey affair with the first meaningful effort not coming until the 25th minute when an overhead kick by Exeter's Ryan Bowman went just over the bar. On the stroke of half-time a long ball from the back reached the edge of the Colchester area. U's defender Tom Eastman headed it as far as Matt Jay who unleashed an excellent 20-yard volley into the far corner of the net. Straight after the restart the visitors should have been on level terms when Kane Vincent-Young played Sammie Szmodics in on goal. Christy Pym reacted quickly and managed to deflect the shot wide to keep the Grecians ahead. This turned out to be the closest Colchester would get to a goal as Exeter dominated the rest of the game. The hosts really should have gone further ahead in the 56th minute when an woefully underhit backpass from Frankie Kent let Ryan Bowman down the right wing. Bowman squared for Lee Holmes but he scuffed his shot straight at U's keeper Rene Gilmartin. Bowman was involved again three minutes later when a simple long ball bypassed the visiting defence giving the Exeter number 12 another one-on-one opportunity with Gilmartin. This time he dragged his shot just the wrong side of the post. 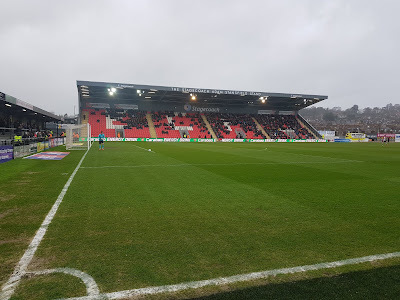 The chances were adding up but they finally did make one pay in the 66th minute - a goal kick was flicked on to Lee Holmes who advanced into the area and clipped the ball over the advancing Gilmartin to put Exeter 2-0 up. With twenty minutes left Mikael Mandron tried to reduce arrears with a strong shot from the edge of the box but Christy Pym was proving on the odd occasions he was required he was up to the job of keeping the ball out. In the 76th minute the game was put to bed by a third home goal when Hiram Boateng was able to run at the away defence before steering the ball into the path of Nicky Law who poked the ball between Gilmartin's legs and into the back of the net. The hosts could easily have added a fourth in the final minutes as Archie Collins and Kane Wilson went close with shots inside the box. A three goal win was comfortably enough for Exeter to move back into the promotion hunt as Colchester's poor run continued.